Bollywood Dance Classes for ALL! 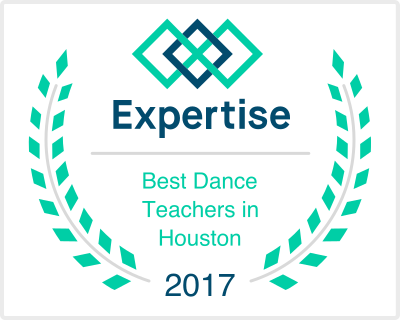 Rhythm-India provides the very best in Bollywood dance training & performances in the greater Houston - Sugar Land - Katy area. We cater to all ethnic backgrounds & age groups…AGE IS NO LIMIT!! We pride ourselves on making our classes fun, accessible, and challenging - We commit to the long-term development of our students. We expose our students to the BEST Bollywood Dancers & Choreographers out there, by conducting multiple workshops through out the year with renowned dancers & choreographers like Saroj Khan, Shakti Mohan, Swarali Karulkar, Jack Gill & Shampa Gopikrishna. Rhythm-India performs year-round at concerts, wedding receptions, private parties, fundraisers, corporate events, social/public events and festivals. 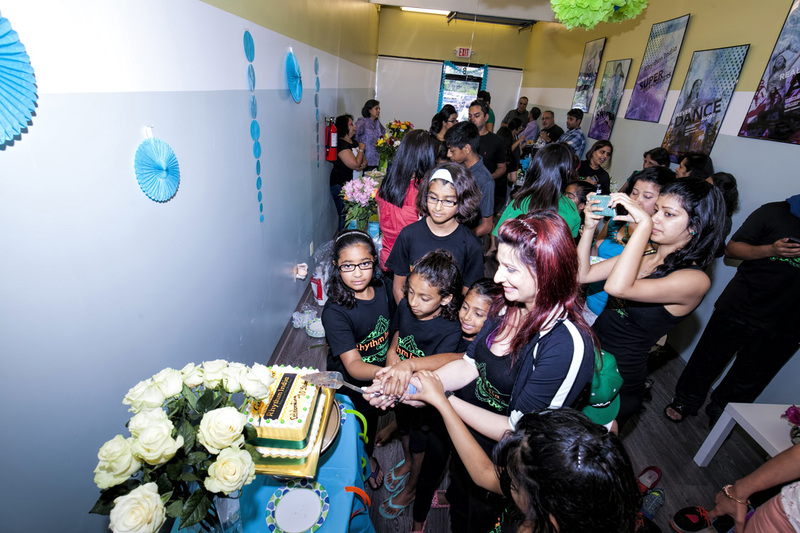 We also provide private lessons and training for special events. You do not have to be a professional dancer or have any prior dance training to enjoy dancing at our Bollywood classes. Our classes are open to everyone - boys and girls, men and women - in fact our adult classes fill up the fastest! Our adult students are discovering just how much more fun they have at weddings and other events when they have the confidence and ability to get out there and take over the dance floor! With the right guidance and a positive attitude, we believe that ANYONE can dance!! We are one month out from our Annual Show!! 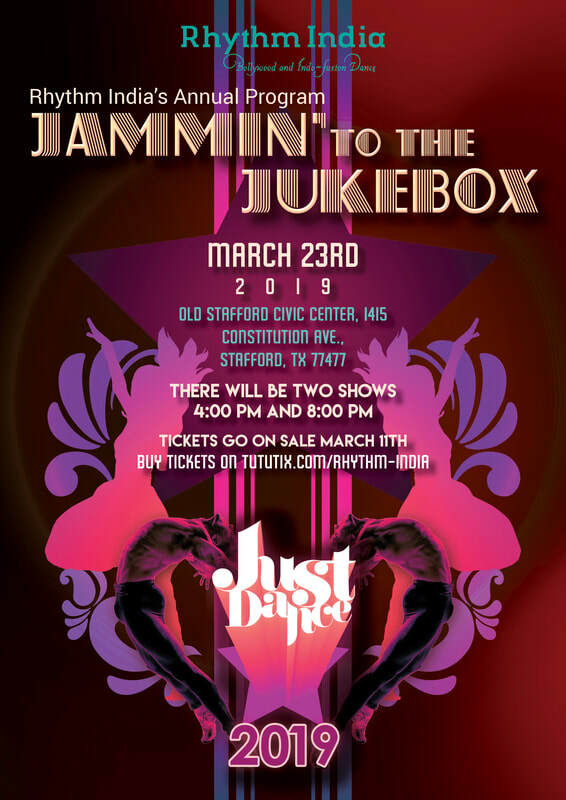 ​Come out for a night of incredible dance and energy on Saturday March 23rd!! 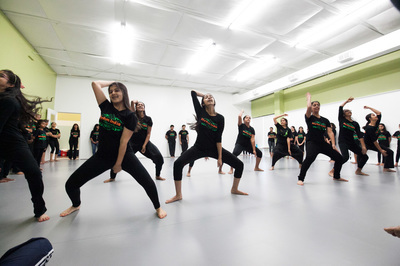 Starting February 12th Dilshad Patel will be teaching a Bollywood and Indo-Fusion Dance Class at Sartartia Middle School. Auditions are here and we want YOU! 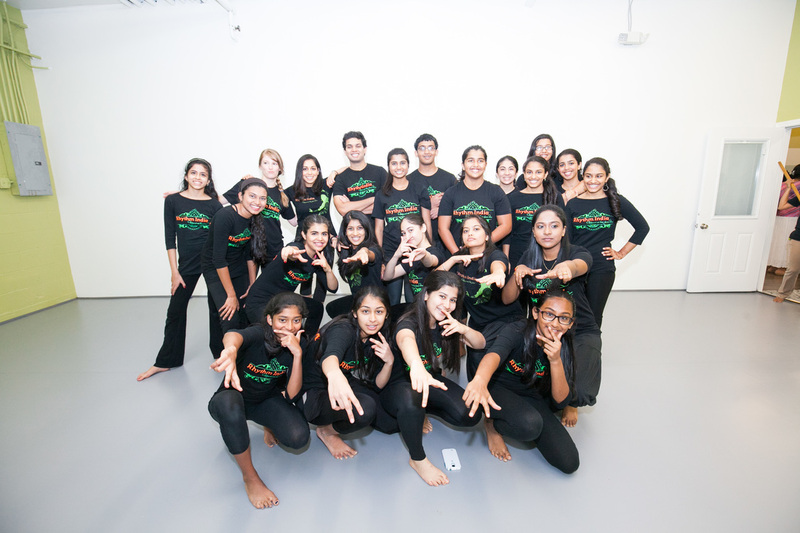 Kids, teens, and adults are invited to join us on October 21st and 28th to take a shot at being a part of Houston's most dynamic and talented Bollywood dance company! 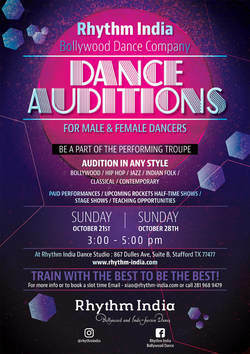 For more details about the audition look at the flyer attached! Let's Boogie ! Bollywood Boogie ! ! Boogie down with us at the Sugar Land Town Square! This is a FREE event open for everyone!! Along with performances by Rhythm India at 8pm there will also be face painting, henna station & vegetarian street food. 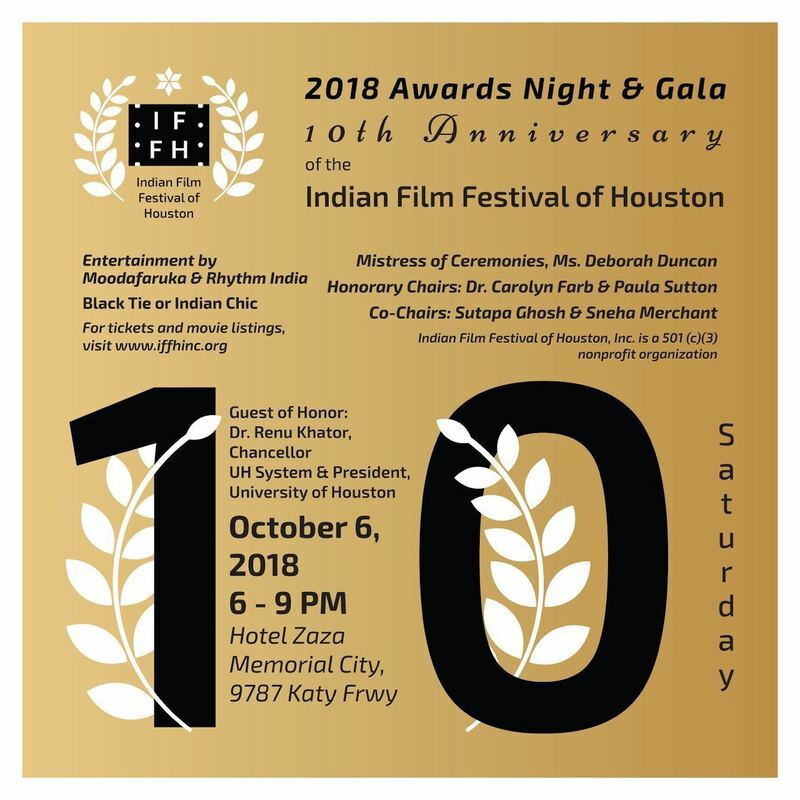 All proceeds from the event are going towards the EAST FORT BEND HUMAN MINISTRIES INC.
We are excited to be performing at the 10th Anniversary of the Indian Film Festival of Houston !!! Rhythm India is so excited to be hosting Dilshad Patel's first FREE Introductory workshop for Movement for Healthcare. To learn more, check out this Indo-American article with all the details. We can't wait for you to join the movement towards better health! Due to popular request, we are starting a new class for our tiny tots: Toddlers Creative Movement & Bollywood Dance taught by our amazing instructor Dilshad Patel !! Kids will learn some fun Bollywood dance moves and improve upon their motor skills and listening abilities in a fun-filled Bollywood dance and movement class for our tiny tots. We found that our kiddos will benefit greatly from such a class in areas of coordination, expressiveness, building strength, a strong movement base and over-all personality and confidence of the child. It will be a FREE demo class so invite your friend to bring their toddlers too! We hope to see you and your toddler there!! Just Dance is Rhythm India's annual show which gives Rhythm India dancers, who have worked hard all year long, an opportunity to perform in a professional-level production - complete with beautiful costumes, lighting, and sound while striving to promote Indo-American culture and Bollywood dance in the greater Houston area. Most importantly, we want our dancers and our audience to have fun and enjoy our show and the production that goes along with it. Through our show we hope to enthrall audiences with new school versions of their favorite oldies and urban Indian-American fusions to explore what this new era of music and media means for Indian-Americans and the music and dance we love. Pictures from the show are now up !! Click here to view !! The Official Video to our Rockets Performance on March 30th!! Many thanks are in order to the incredible contributors who made this performance and memory possible. Our Artistic Director extraordinaire, Arzan Gonda, the mastermind behind the RI Magic. To all our Rhythm India Dancers, Choreographers, Parents, Supporters, Friends, we always say that you are part of our Family. Thank you for your unending support! Murali Santhana for capturing most beautifully our expressions and dance on each stage. We love you!! You Asked ! We Listened! BOLLYWOOD BLAST 2017 was a huge success!! The Rhythm India Bollywood Dance Company choreographed & performed at the biggest Bollywood show of the year on Sunday, Oct 29th 2017 at the Miller Outdoor Theatre. The theme of the show was The Bollywood Bachelor. The entire show was directed & choreographed by Arzan Gonda & the Rhythm India Bollywood Dance Company. Thank you to all our supporters & fans for making it a night to remember. To view some of the show highlights click on the video below. Rhythm India's Half-Time Show at the Houston Rockets v/s Phoenix Suns NBA game will be on Friday, March 30th 2018!! 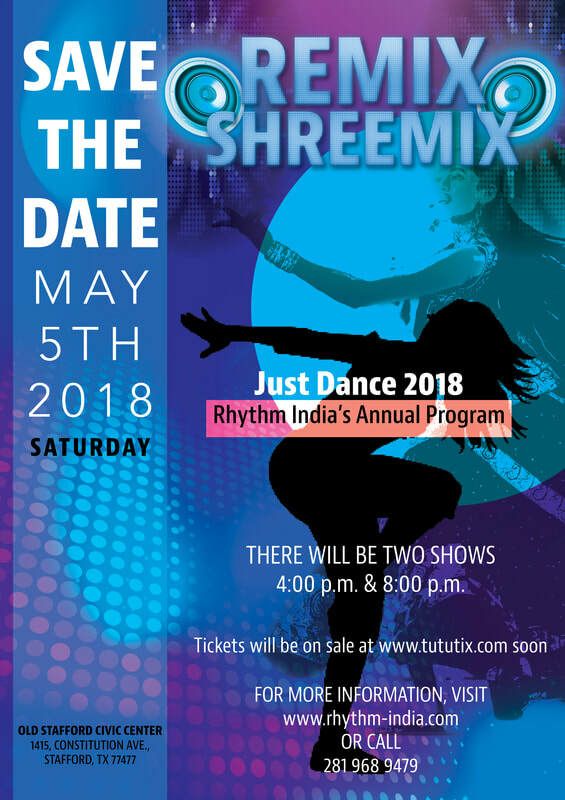 Rhythm India's Annual Program "Just Dance 2018" will be held at the Old Stafford Civic Center on May 5th 2018. 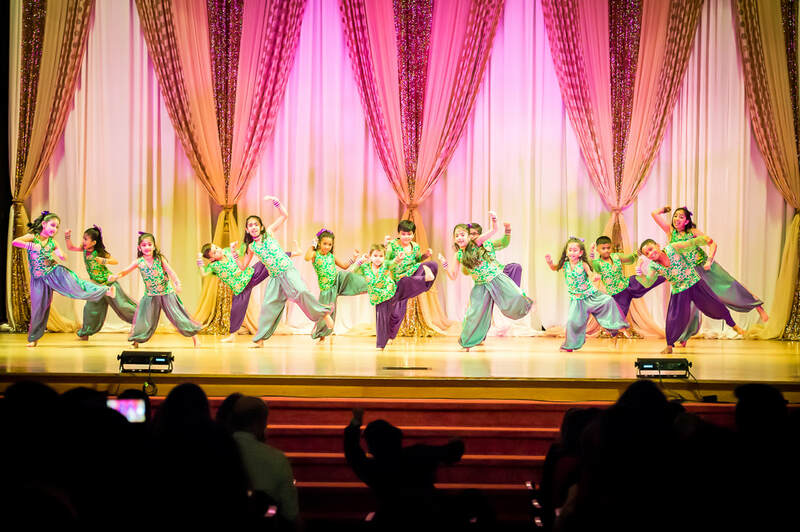 The goal of the show is to give our Rhythm India dancers, who have worked hard all year long, an opportunity to perform in a professional-level production - complete with beautiful costumes straight from Bollywood, lighting, and sound. We are truly honored and humbled & look forward to spreading our love for dance with our ever expanding Rhythm India family. ​Enroll Now for the Fall Session!! Come dance with us this Fall!! The Fall session begins on September 13th. 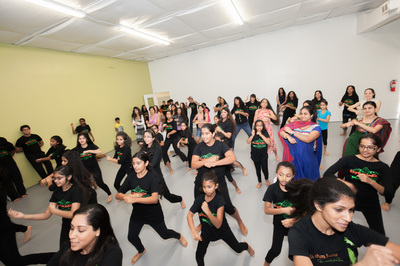 Engage your kids in a fun and active way OR you can try out our Bollywood Fitness Classes called JHOOM!! Our classes fill up fast so enroll now for the fall session!! For more information about class locations & timings CLICK HERE or to enroll CLICK HERE. ​"Just Dance 2017" was a great success..
﻿Rhythm India's Annual Program "Just Dance 2017" was held at the Stafford Civic Center on March 4th 2017. 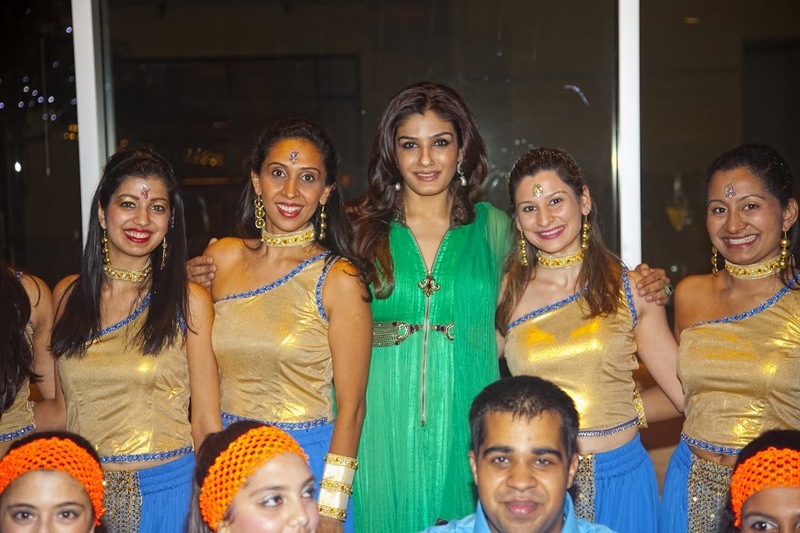 It was a memorable evening filled with non-stop Bollywood madness, with dynamic performances by the Rhythm India Dancers as young as 4 yrs of age. This past year the theme of the show was "Millenium Mayhem", our dancers showcased songs & dance styles from the year 2000 on wards. ​Rhythm India Bollywood Dance Company hosted a 2 day intensive dance workshop with Celebrity Dancer, Bollywood Choreographer and 2-time Jhalak Dikhlaja Winner, Shampa Gopikrishna. 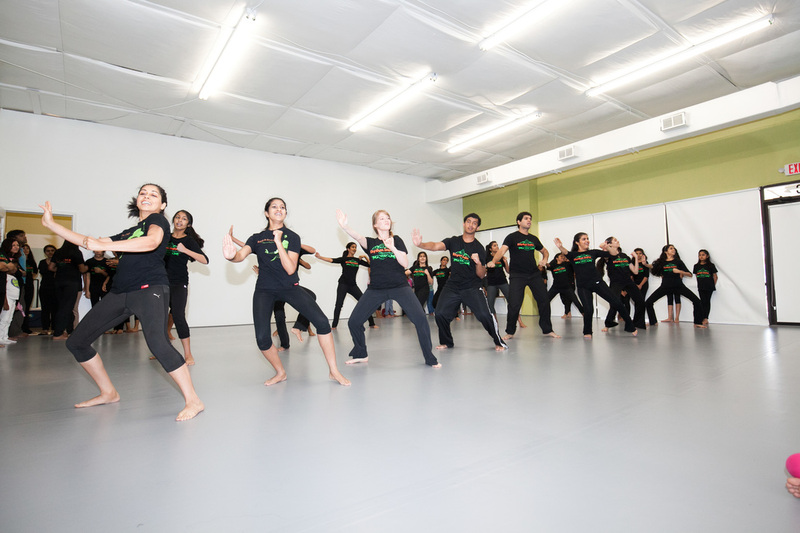 The workshop was held at the Rhythm India Dance Studio on Saturday, April 15th & Sunday, April 16th. Needless to say the workshop was a huge hit with all those who signed up for it & got to experience Shampa's passion and talent first hand. We are looking forward to may more workshops together. It was an honor to have the legend herself at our studio, & watch her train all our students. We cannot wait to have Sarojji back in Houston again. 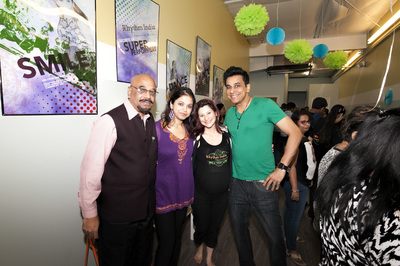 Rhythm India was featured on the popular TV show "The Little Couple". 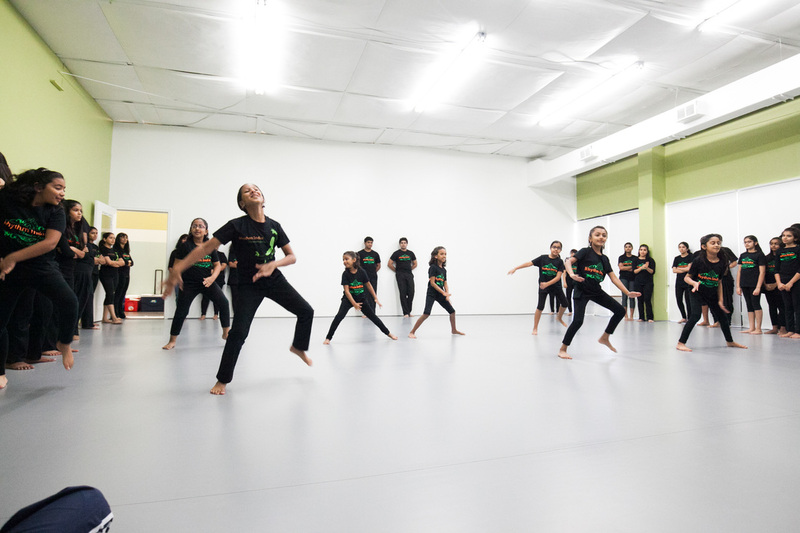 Need rehearsal space or studio space for classes? Rhythm India Dance Studio has three studio rooms which are available for rent. If you or your company are interested in renting studio space, please contact our administrative manager Paromita Ray at paro@rhythm-india.com or CLICK HERE to fill out the rental application form. To read the review in the Indo American News CLICK HERE To view the photo collage CLICK HERE. 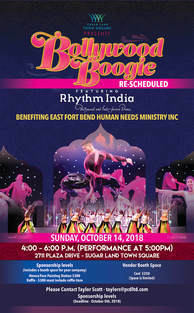 Rhythm India dancers - including company members, adults, juniors and kids will be performed at the Seabourne Creek Park in Rosenberg on Sunday, March 30th. 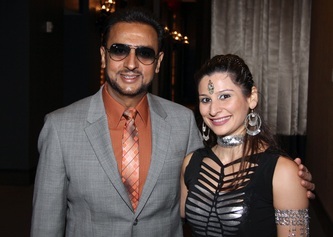 The event was organized by Masala Radio and it is the largest South-Asian gathering in Houston. Pictures & videos coming soon!! 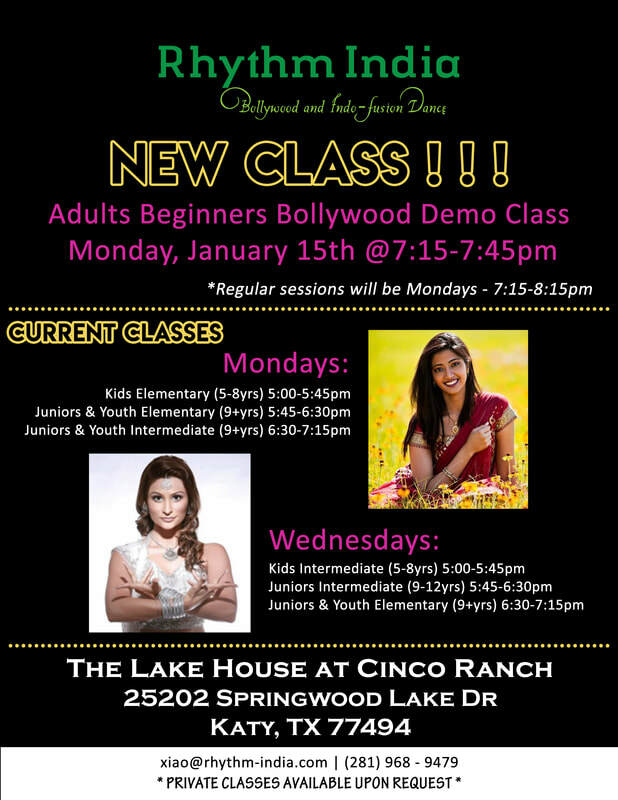 Rhythm India Bollywood Dance - Now has Classes in DALLAS!! 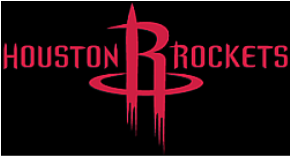 The Rhythm India Company Dancers performed at the Rockets game on Friday, April 12th 2013 at the Toyota Center. 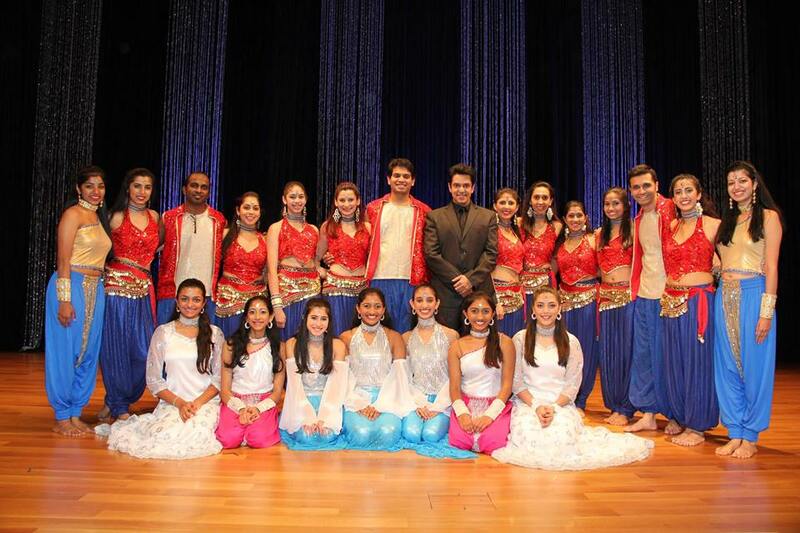 Rhythm India dancers performed at the Houston IFEST on Sunday May 1st at 5:45pm on the Asia Society Texas Center Stage. Please visit the Houston Ifest website for more details! Rhythm India Bollywood Dance of Houston and Sugar Land Performed Live on Channel 11 on August 27th 2010! 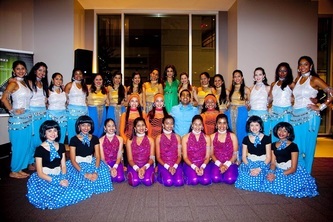 The Rhythm India Bollywood Dance School and Company performed on live tv - Channel 11 at 9am Friday the 27th of August - on "Great Day Houston" with Deborah Duncan. It was an amazing experience and we all had a wonderful time with Deborah and the audience! JAI HO AR RAHMAN CONCERT - September 17th 2010! 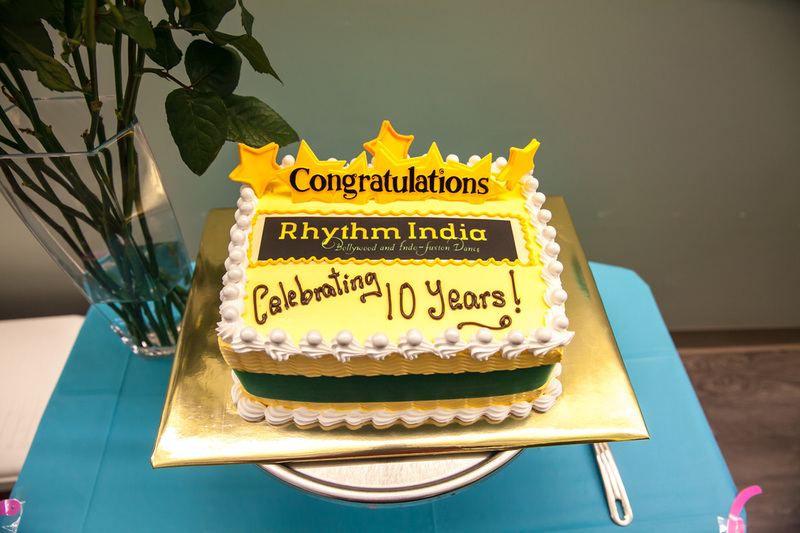 The Rhythm India Dance Company was the opening act for the Jai Ho A.R. Rahman Concert on September 17th 2010 at the Toyota Center in Houston! Copyright © Rhythm India. All rights reserved.